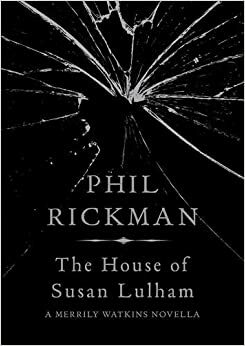 The House of Susan Lulham is part of Phil Rickman's popular Merrily Watkins series*, but is not a full-length instalment - it's a novella (around 100ish pages), currently available as a rather beautiful little hardback edition as well as an appropriate-priced Kindle Single and a three-hour audiobook download. Parish priest Merrily is contacted by a woman convinced that her modern, architect-designed home is haunted by the ghost of its previous occupant, a minor celebrity who took her own life in a particularly gruesome manner. As a trained 'deliverance' minister - that's a Church of England exorcist to you and me - Merrily blesses the property, but as usual with Merrily's cases, things don't end there. The length of the story means there are no subplots and the large cast of recurring characters regular Merrily readers would recognise is mostly absent - there are brief appearances from Jane, Francis Bliss and Sophie (who happens to be one of my favourite characters in the series) but this is very much Merrily's story. That's not a criticism - my principal disappointment in the last full-length book in the series was that there was not enough of Merrily in it, and a novella is very different animal from a 400-page novel, with less room for a complex plot. Perhaps also for this reason, there is less in the way of mystery here than in the full-length books. Many bookshops classify the Merrily Watkins series as crime rather than horror or paranormal, but The House of Susan Lulham feels much more like a straightforward ghost story than anything else. Many of Rickman's books feature old properties and ancient rural folklore, but in this story there's a pleasing contrast between age-old fears and rituals and the modernity of the haunted property. If you're a big Merrily fan, I'd recommend this an interesting, although non-essential, add-on to the series. If you're not, this book probably works well as a standalone introduction - whereas the other novels are best read in order of publication, The House of Susan Lulham doesn't really require any additional context to be enjoyed. It's strong on atmosphere and the characters - even the ones we only encounter through conversations with others - are credible and three-dimensional. *At the time of this blog post, a TV adaptation of the second book in the series, The Midwinter of the Spirit, is being broadcast on ITV, starring Anna Maxwell Martin as Merrily. It's a well-made and creepy drama, but not especially faithful to the book, with various changes made to the circumstances and relationships of the characters.